Please refer to our stock # 606 when inquiring. From France at 19th. 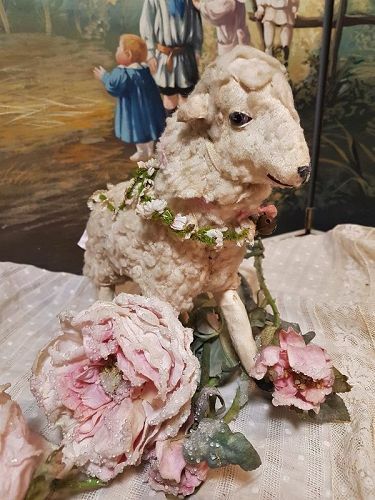 century and now in condition as is , 9 " ( 23 cm ) high paper mache lamb covered with lambswool fur , head with kidskin face , has inset glass eyes , sculpted and painted nose and mouth . It has his original ears and white leather covered lower legs and fur tail . It has a hidden mechanism in his belly , so if you press down his head the lamb bleats " Baa-a" ........ !! It was a attic found and has all complete condition as is and shown here , note little dusty condition and one repaired leg , one glass eye has an hairline . A charming decoration piece for one of your favorite doll in your collection !! The lovely Denamur Bebe in my pictures you can find in a separate offer in my shop ! Thank you for your interest on my Doll-Shop and if you have any question or needs more or special pictures please let me know.<> Layaway are always welcome, please ask about !